If you are purchasing smoked salmon fillet for the first time, the task may be somewhat daunting. Unlike buying fresh salmon, traditionally labeled by species and available whole, filleted or cut into steaks, choosing smoked salmon is more complex. Smoked salmon fillets usually include this information on the packaging. Despite what people from different regions claim, high quality salmon swims in many regions around the world. Like many foods, what consumers consider the "best" is largely dependent upon personal taste. Salmon sold in the United States normally comes from the Atlantic, North Atlantic or Pacific Oceans. Some breed in rivers located near cold ocean waters and others thrive on salmon farms. Just about any salmon is appropriate for smoking. Popular species include Chinook, Coho, Pacific, Wild Alaskan and King. Additional information regarding the geographic roots is often included in the description, although this data has little to do with the taste or quality of the fish. Again, this distinction does not affect salmon quality. Scottish, Irish and Nova Scotian varieties are prevalent, and their tastes vary according to the recipes used. Personal preferences dictate the desired level of smokiness, fishy flavor and saltiness. All these factors depend mainly on the ingredients in the producers' various recipes and the smoking method used. The two methods used to smoke salmon are hot and cold. They often have similar appearances but the parallels stop there. This type is cooked and smoked at 120F to 180F degrees between six and twelve hours. The fish cooks over wood or coals or in a heated, sealed environment to permeate the flesh with a strong, smoky flavor while killing harmful bacteria. The appearance is opaque and flaky. This process is more complicated and time-consuming. The salmon fillets cure in salt for up to six hours to flavor the fish and prevent the growth of harmful microbes. Next, usually after being dried, the salmon undergoes a slow smoking process of 24 hours to three weeks in low temperatures between 70F and 90F degrees. Unlike hot smoked salmon, the fillets never have exposure to intense heat. At the end of the process, the salmon is still raw but edible and tasty. 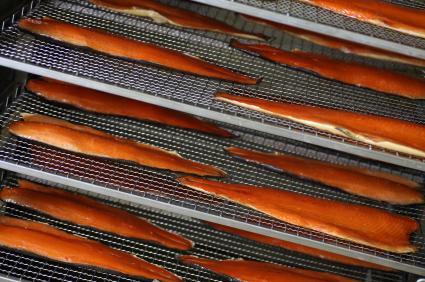 Each type of smoked salmon requires different storage conditions and is displayed for sale in distinct environments. Hot smoked salmon can be safely stored at room temperature for up to five years. Cold smoked varieties are highly perishable and require refrigeration. It normally keeps for about two weeks in the refrigerator if freshly cut at a deli or specialty store, and a bit longer if it is stored in an unopened, vacuum-sealed package. Since hot smoked salmon is shelf-stable in any environment, it is the type found in gift baskets or in the non-perishable food aisles in supermarkets. Cold smoked salmon is sliced-to-order at deli and seafood counters or sold vacuum-packed in the refrigerated sections of food stores. Both hot and cold smoked salmon fillets serve as first courses at lunch or dinner. Bagels smeared with cream cheese and topped with smoked salmon have long been favored for breakfast and brunch. The fillets are also popular ingredients in hors d'oeuvres and appetizers where they are often cut into bite-size pieces, placed atop party-size rye or pumpernickel bread rounds, and garnished with a sprig of fresh dill, a dollop of crème fraiche and a tiny dab of caviar. If you find a particular type or brand of smoked salmon that delights your palate, don't stop there. Find a deli or specialty food shop that offers taste samples and explore the vast differences between cold and hot smoked salmon and the various flavor additives of assorted producers.